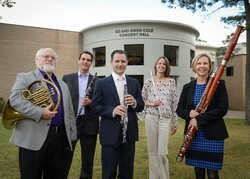 SFA's Stone Fort Wind Quintet, featuring music faculty members Charles Gavin, Christopher Ayer, Kerry Hughes, Christina Guenther and Lee Goodhew, will present a recital at 7:30 p.m. Tuesday, March 27, in Cole Concert Hall on the SFA campus. NACOGDOCHES, Texas - The Stone Fort Wind Quintet at Stephen F. Austin State University will perform at 7:30 p.m. Tuesday, March 27, in Cole Concert Hall. The faculty recital is a feature of the SFA School of Music's Calliope Concert Series. The quintet includes music faculty members Charles Gavin, horn; Christopher Ayer, clarinet; Kerry Hughes, oboe; Christina Guenther, flute; and Lee Goodhew, bassoon. Works to be performed include Quintet for Flute, Oboe, Clarinet, Bassoon and Horn, op. 71 by Ludwig van Beethoven; "Quinteto de Sopro" by Osvaldo Lacerda; Six Riotous Rhymes for Woodwind Quintet With Narration by Trevor Cramer and words by Carole Scutt; and "La Milonga" by Christopher Caliendo. Beethoven's classic work for woodwind quintet in four movements was originally composed as a sextet for two clarinets, two bassoons and two horns, according to Guenther. The first movement opens with a brief stately Adagio before the clarinet leads into the Allegro. "This movement features dramatic melodic lines with varied dynamics and high energy," Guenther said. "The second movement begins with a horn solo that is featured throughout the movement. The Menuetto is a light dance that opens with horn and bassoon answered by the flute, oboe and clarinet. The final movement is a high-energy rondo that has lovely melodic lines and stately pronouncements between the ever-repeating A theme." Lacerda's "Quintet for Winds" is another four-movement, high-energy piece, Guenther explains. The first movement is energetic with many rhythmic and tempo shifts. The second movement is an animated 6/8 with driving eighth notes and insistent accents. The third movement opens with a recitativo bassoon solo, and then continues with singing lines throughout the ensemble. "The final movement, vivo, is spritely and dance-like, recalling some thematic material from the first movement," she said. Six Riotous Rhymes for Woodwind Quintet is based on the books "Riotous Rhymes for Children of all Ages" and "Rhyme Time." The six movements feature comical narration presented by the ensemble players throughout each movement: "Two Rabbits (or more hare to spare)," "Catered Affair," "Unique Antique," "Clearly I'm a Jellyfish," "Peep in Touch" and "Bear With Me." Of the work, the composer writes: "The music is not meant to be profound - just good fun!" Milonga is a musical genre that originated in the Río de la Plata areas of Argentina and Uruguay. Popular in the 1870s, it was derived from an earlier style of singing known as the payada de contrapunto and was set to a lively 2/4 tempo, as are most milongas, Guenther explained. "Caliendo's 'La Milonga' is a highly energetic work based on this genre that is sure to have you dancing in your seat," she said. The concert is a presentation of the SFA College of Fine Arts and School of Music. Cole Concert Hall is located in the Tom and Peggy Wright Music Building, 2210 Alumni Drive.